I always get asked by those who are thinking about updating or renovating their kitchen, “what are the latest trends?” “What do I need to include in my project so that my project will last and be current for many years to come?” While most people don’t want to be too trendy in an area as expensive and as permanent as a kitchen, everyone does want to have the latest and greatest features and style that will keep their kitchen looking fresh and up to date for many years to come, especially if they are thinking about resale value in a few years. For 2016 and I do believe for the next few years to come, white kitchens, whether traditionally styled or contemporary are here to stay at the forefront of the kitchen trend. Gray also continues to act as the counterpoint in color for much design. Quartz countertops and hard wood floors seem to still rank as everyone’s favorite for their ease of maintenance and durability. Every year appliances get smarter and help even the novice cook look like a pro. 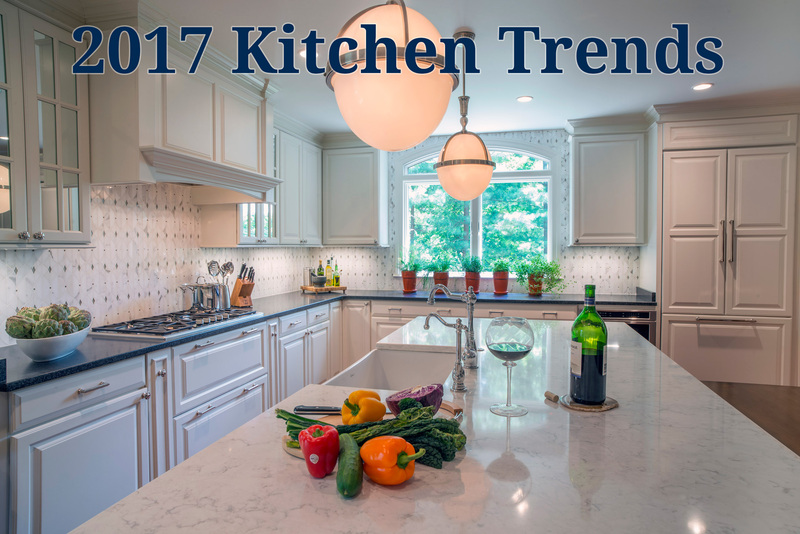 But there are some trends and features that I believe are going to become even more important and standard in the custom kitchen market. By adding a few of these trends for 2017, you can have a kitchen that will stand up against kitchens in the future, while making your space more functional and enjoyable today. Graphic Tile This trend is straight from Europe and the recent EuroCucina kitchen show. But we have been seeing examples coming into our showroom for the last several years. Tile today is so much more than basic subway or Carrera marble. Today’s kitchen designers are using the modern technology of porcelain tile to create wonderful floors or walls in graphic patterns that work well in both traditional and contemporary settings. These tiles are not only durable but stunning to look at. Reminiscent of old European hand painted tiles; they can add a wow factor to an otherwise common kitchen. The key is to use them as an accent on the backsplash or as a rug design under a table or island. Worried about color? Then chose a pattern in a muted or neutral color of beige or gray, but keep the boldness of the pattern. 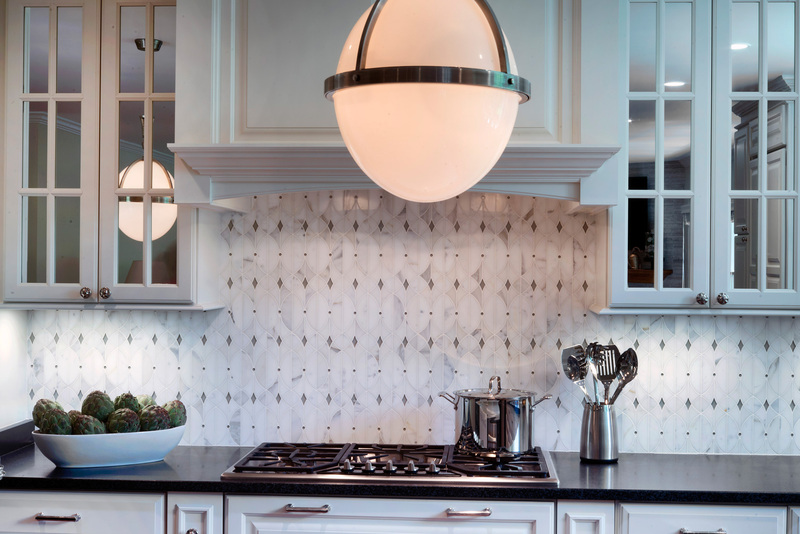 These geometric shapes are here to stay as an accent to your solid white and gray kitchen. The patterns may be from the past, but the look is meant for now. Induction Tops While the induction cooktop technology has been around for many years, only recently has it really taken off. And why not? Induction cooktops offer so many advantages with almost no downside. The induction cooktop always stays cool to the touch- not heating up your kitchen and providing an extra layer of safety that nothing else offers. They are as good as or better than gas cooktops in their ability to offer precise and immediate control of temperature and to maintain a low heat level for hours. As for speed, you can go from cold to boiling water in a saucepan in about 90 seconds. They are extremely energy efficient and the smooth surface is a breeze to clean with most brands having no knobs or buttons. Yes, you have to have a pan or skillet that is magnetic based such as cast iron or magnetic stainless steel but higher end cookware meets this standard. The end of the electric cooktop is coming to a close and while gas cooktops have their loyal fans, you owe it to yourself to try out an induction top before you remodel your kitchen in 2017. Pet Spaces This is not so much of an emerging trend as it is a must have for any kitchen in 2017. We all love our pets. They are like family. And if the kitchen is the heart of the home and our pets are our family, you must incorporate their needs into your kitchen plans. A recent survey by members of the National Kitchen and Bath Association ( NKBA) found that more than 35% of designers were incorporating pet areas into their client’s kitchens. Vets even recommend that larger dogs have their bowls raised up from the floor to make eating and digestion easier. We have done many kitchens recently with water and food bowls that disappear into the toe kick when not being used. 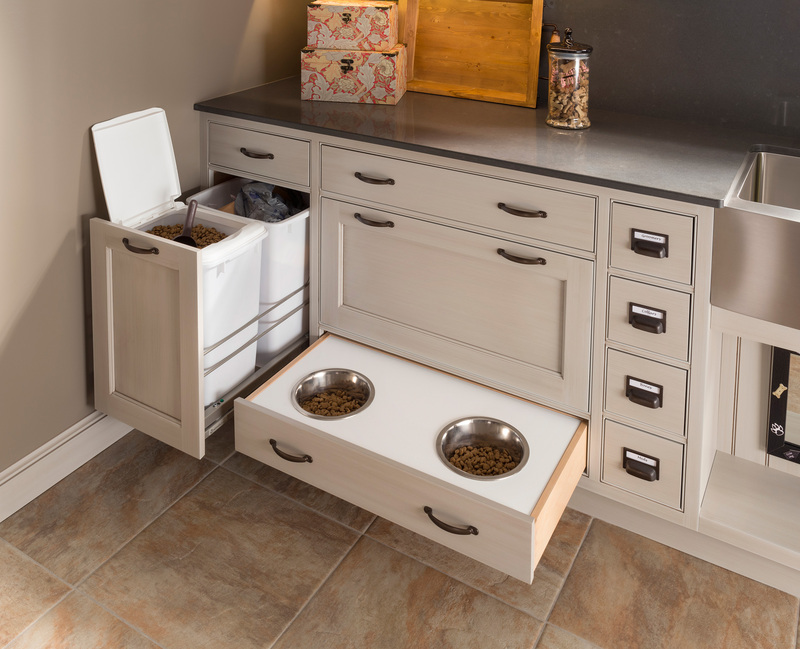 Whether it is as simple as a special drawer for their leash or toys and food ,or a more permanent and built-in solution such as a pet bed or feeding station, planning for your pets needs in the kitchen area is always going to be on trend no matter what the style or the year. Docking/Charging Stations It is a fact of life: we are all connected and rely on our smartphones, tablets and laptops. And if we are spending more and more time in the kitchen, it is natural that we need to accommodate these devices in a functional and stylish manner. The future is only going to have more devices, not fewer, so getting on the bandwagon of organization for your devices is key to a kitchen design that can stand up to future buyers. 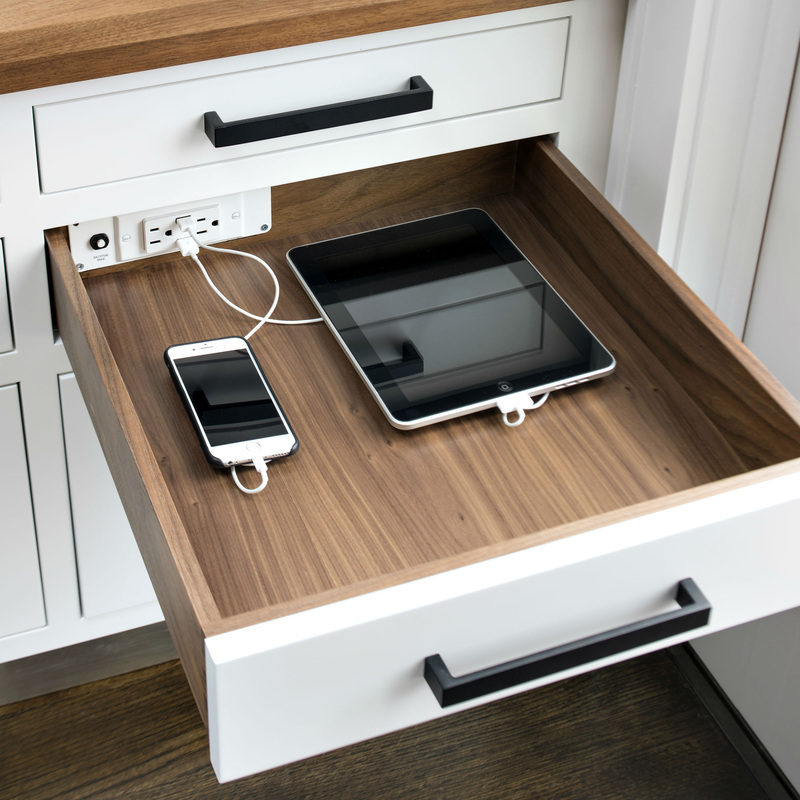 Today we are seeing drawers that are made with built-in USB and electrical connections. There are also options for pop-up units that can also keep you connected and charged. LG has even come out with an option to be able to make any area of their quartz countertops conductive so you can charge your device by simply placing it on the designated area! When planning for a new kitchen, you must plan for the future and all the smart devices for you and your family will always be a part of that future. Beverage Centers With the ever growing trend for entertaining friends and family at home and the continuing popularity of cooking shows, the kitchen has now become the entertaining hot spot for most people. With great food comes good drinks and the emergence of the beverage center as a must have for many families. Whether you can dedicate an entire wall to this area or even just a niche, this growing trend provides convenience and good times for everyone and keeps your guests, kids and family out of the way of the proper cooking area during events and preparation time. 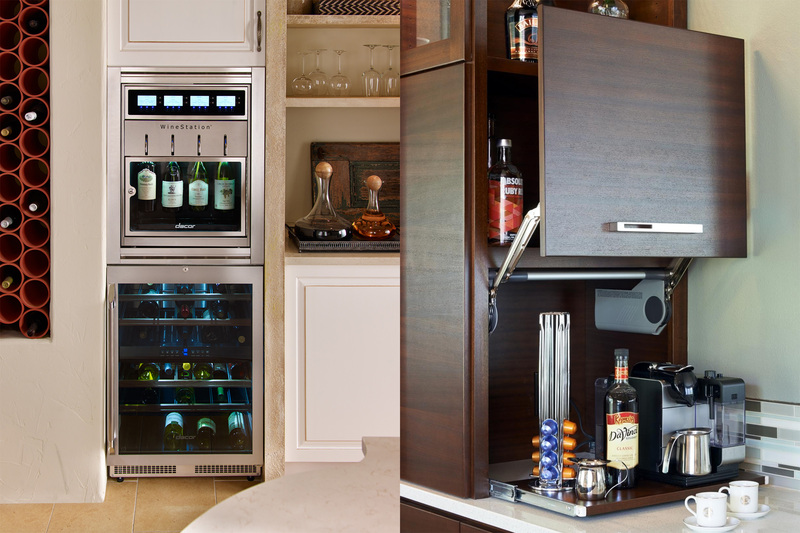 Appliance manufacturers are stepping up and now offer wine station dispensers, along with the continuing popularity of the built-in coffee machine that is like having your very own barista without having to wait in line! Pairing this with a secondary beverage or wine cooler and dedicated ice machine and you are equipped to handle any drink request that you or your guest can dream of.